When I was in kindergarten, we sang songs on stage as a grade level. The only memory I really have about that evening, was that we sang a rainbow song. I sing it all the time in my preschool classroom during our rainbow theme. Each time I sing it, my preschool kiddos remind me that pink technically does not belong in the rainbow. I guess back in the ’80’s it did! 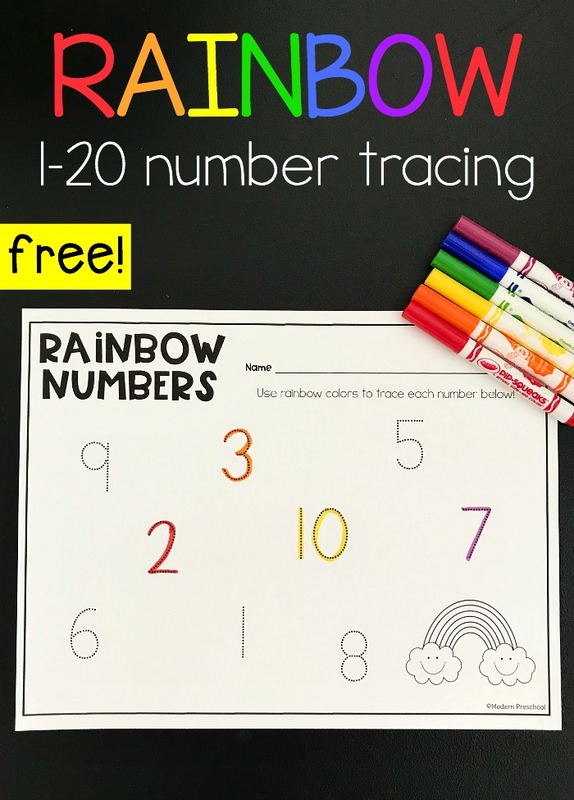 Either way, my preschoolers get a lot of themed learning with all of our rainbow activities including our rainbow tracing numbers printable! 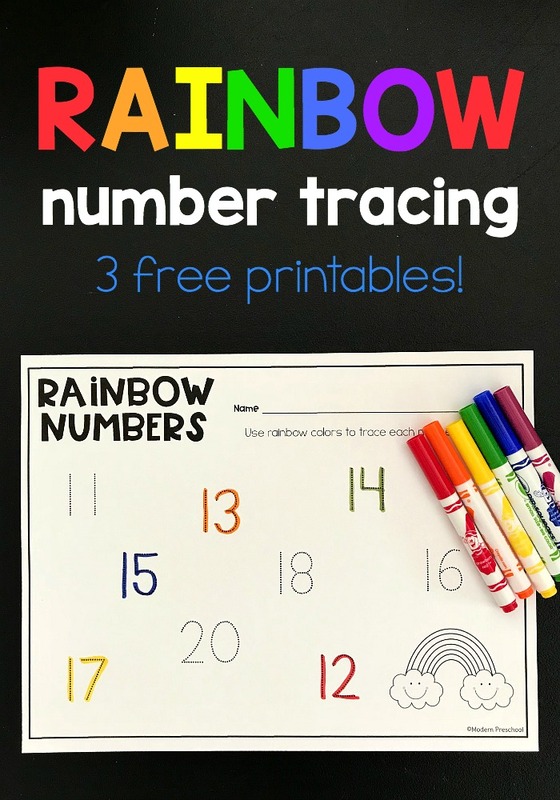 The rainbow tracing numbers printable includes 3 versions. The first includes numbers 1-10, the second includes numbers 11-20, and the third includes all numbers 1-20. This printable math centers is a no prep learning activity! Print the version of the tracing numbers printable that works with the current learning level in your classroom from the file below. Make copies for the small groups in your classroom. Add rainbow colored markers, crayons, or pencils too. Now technically, you’re set, but I love to add even more learning and fun to my math centers! Differentiate this activity depending on what the learning focus is. In my own preschool classroom, many of my preschoolers can easily get tripped up by those tricky teens! It’s funny because they can identify the 20’s, 30’s, etc. better than the numbers in the teens sometimes. For this group, I would use the rainbow tracing numbers sheet that includes the numbers 11-20. My preschool classroom is full of hands-on learning opportunities. I think that these are important for little minds to become engaged in learning and encourages involvement and fun! I am not a huge fan of worksheets in my own classroom, but do realize that there are certain situations where worksheets may be needed. Instead of just handing over a tracing sheet to your students, add even more number practice to the activity. Use number magnets or number puzzle pieces. I found a puzzle at Walmart that included all numbers up to 20. Put all numbers into a bucket or even a sensory bin. One by one, find a number, identify it, and then find the matching number on the tracing sheet. Trace the number and play again. When using this activity in a small group, have the kids take turns finding and number and identifying it. Then each member of the group finds and traces the matching number on his/her recording sheet. As I prep my 4 and 5 year-olds for kindergarten, I have tried to introduce activities that include multiple steps and directions, but can still be completely independently. Our rainbow number match pairs perfectly with our tracing sheets! They also add another dimension of number practice. Match the numbers of the rainbow puzzles, and then find the matching number on the tracing sheet. 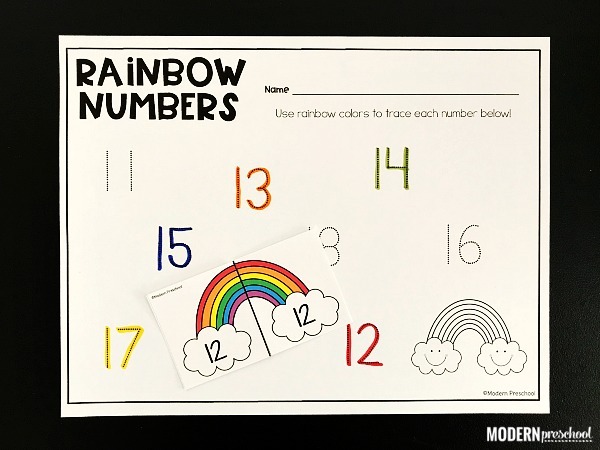 Print your own copy of our rainbow number match activity, and bulk up your math centers! 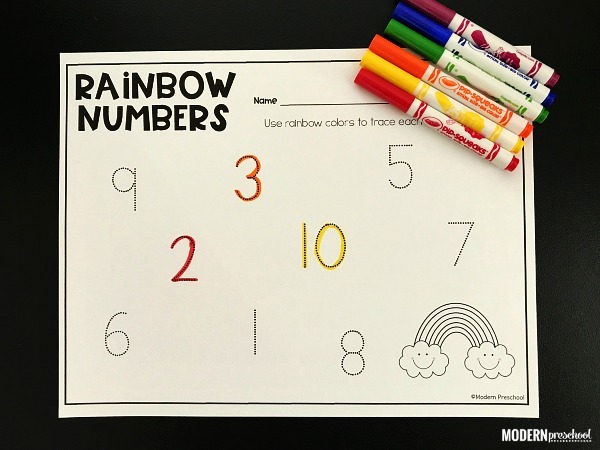 Download the rainbow tracing numbers printable from the pink button now.